Looks like there's a new app called Legends on the way. 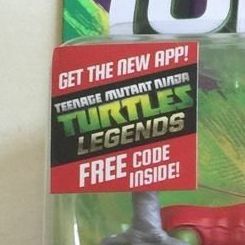 The sticker was found on the movie figures package. Interesting. I hope someone posts what it's about. At every turn, the Teenage Mutant Ninja Turtles have thwarted Kraang Prime’s plans to terraform the Earth into Dimension X. What’s an evil overlord to do? Hatch a nefarious new scheme, to create an army of Ultra Mutants! Everywhere, the Kraang has kidnapped mutants for their DNA – including the Ninja Turtles. With his brothers’ pulled through a Kraang Dimension X portal, Leonardo must recruit the Ninja Turtles’ allies and foes alike before it’s too late. Leonardo solo mission? Reminds me of Radical Rescue on Game Boy, where the other three turtles were unlockable. Yeah you started with Mikey and then slowly unlocked everyone else. I recently completed that game actually. It was ok if slightly confusing. ORIGINAL NINJAS: Explore the Nickelodeon Teenage Mutant Ninja Turtle universe with an All-New Original story. Battle your way through 7 chapters and over 70 stages to take on the baddest of bosses – Shredder, Kraang and more! TURTLE POWER: Help Leonardo as he takes on the Kraang army to save his Ninja Turtle brothers and fellow mutants. Play alongside Leonardo in a 5 on 5 battle with your favorite TMNT characters. MUTANT MAYHEM: Collect and level up over 30 TMNT characters! Train them to learn their super sweet moves and build your Turtle-rific team! Don’t forget to pack your freezer for Ice Cream Kitty! WE RUN THIS TOWN: Fight against the Kraang in the Ninja Turtles’ favourite locations from the TV show, including Dimension X, the sewers and the classic New York rooftops! Seems to have a pretty wide selection of characters, given Pizza Face there. After 29 years we finally have an official game where we can play as Bebop and Rocksteady. Color me intrigued. No idea what the gameplay is like, but that roster has me impressed. I downloaded the game this morning, it's like a typical fight through waves of enemies each level type of mobile game. As the game progresses you unlock more characters. Right now I have Leo, Karai, Newtralizer, and Spider Bytez. That's a large roster. Is Ice Cream Kitty in there? Hard to believe they completely missed out on three unique versions of Tournament Fighters back in the day. The closest thing they got was background cameos in the SNES version. It would appear the app is only available in Australia so far. I hope that changes. It'll probably launch in the states around the time the movie comes out. All you have to do is create a new Apple ID and choose Australia as the country and find a Australian address to use. Wow, pleasantly surprised to see Hun among the roster. He's not one you'd expect in the usual gamut of Nick baddies. Also, some Mondo Gecko and Muckman action! NO SLASH OR LEATHERHEAD, THOUGH?! You'd think they'd be shoe-ins, especially given that ICK, The Creep, Pulverizer, and freaking JUSTIN are in. Mutanimal-themed update in the future, maybe? Also kind of bleh that there's no voice-acting like every other Nick TMNT app, but the story seems kind of "whatever" anyway, so I can overlook it. Well there's not really any voice acting in any of the other Ludia games either so that makes sense.